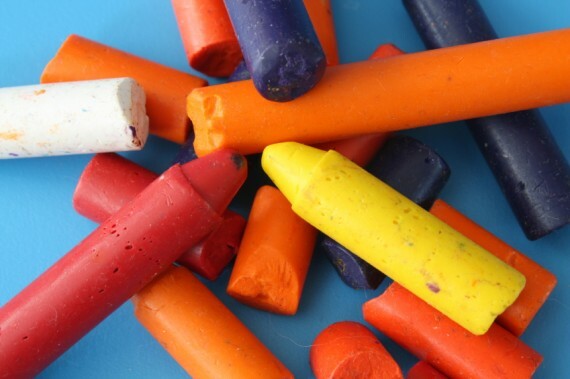 If you have school aged kids, or toddlers, you probably know that crayons break, and they become difficult to use. They get blunt, and don’t sharpen very well. And eventually you end up with a huge box of broken crayons that no one uses. Well, whatever you do, don’t throw them away!! Thee are lots of fun projects for which you can use those old crayons. whatever you do, don’t throw them away!! My kids love putting them all inside mini muffin pans. I give the pans a quick spray of nonstick coating, then let the kids remove any papers from the crayons and mix the colors in the tins as they see fit. Sometimes they mix all the blues in one cup, all the greens in another, and other times they mix lots of colors in each cup. Once they are satisfied, I bake them in a 350 degree oven for about fifteen minutes. Just long enough for the crayons to melt and begin to mix together. Take them out of the oven and let them cool completely before removing them from the muffin tin. My kids love using these crayons. It’s exciting for them to see what colors they will get when everything melts and then settles again. Another fun project is to melt the crayons onto a canvas with a hair dryer. You can tape the crayons at the top, aim the hair dryer at them pointing down, and make a fun drippy art piece. You can also tape the crayons in other designs and melt them into various shapes. It’s always great to recycle, clears up clutter and makes for a fun art project for the kids.